Loren Jacobs, who spoke at a rally with the vice-president, was stripped of his ordination by the Messianic movement in 2003. The "Messianic rabbi" who outraged many Jews by invoking the name of Jesus while delivering a prayer in memory of the Pittsburgh synagogue massacre victims was also spurned Tuesday by the organization that ordained him. 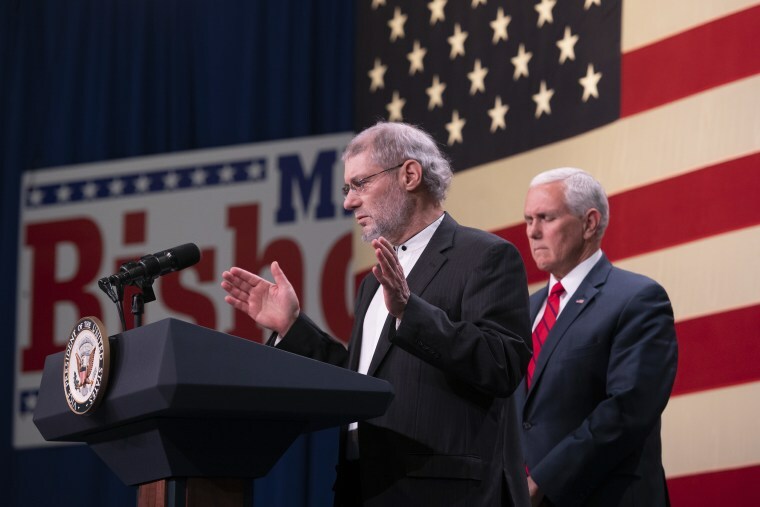 Loren Jacobs, who was invited onstage by Vice President Mike Pence to speak at a rally in Michigan for a GOP congressional candidate, was defrocked 15 years ago, according to a spokeswoman for the Union of Messianic Jewish Congregations. “Loren Jacobs was stripped of his rabbinic ordination by the UMJC in 2003, after our judicial board found him guilty of libel,” Monique Brumbach said in an email. Brumbach did not say who Jacobs allegedly libeled, but it appears from his synagogue website he was involved in a theological battle with other leaders of the group, which believes that Jesus is the son of God — a belief that is anathema to the vast majority of the world's Jews. Jacobs seemed to be concerned that the group was insufficiently conservative on doctrinal matters. Meanwhile, mainstream Jewish leaders and experts on the faith said they could not fathom why GOP congressional candidate Lena Epstein, herself a longtime member of a Detroit–area synagogue, invited Jacobs at all to her rally Tuesday because in their eyes he’s not even a real Jew, let alone a rabbi. As for Jacobs, he was not taking any questions about his brief appearance onstage at a rally in suburban Detroit that set social media aflame. And it’s their belief in Jesus as a divine savior that makes "Jews for Jesus" like Jacobs pariahs in the Jewish world, experts said. In mainstream Jewish theology, the messiah has not yet arrived. Pence, who has called himself a born-again evangelical Christian and an ardent supporter of Israel, has been harshly criticized for having Jacobs come onstage to “offer a word of prayer” at the rally for Epstein, a Republican running for Congress in Michigan’s 11th District. His spokesman later insisted that Epstein invited Jacobs to the rally. But while Epstein went on to accuse critics of her or Pence of “religious intolerance,” the candidate did not explain why Jacobs got the nod to give the prayer. In fact, she did not mention his name at all in her tweet. Neither Epstein nor her campaign spokesman could be reached for comment Tuesday. Epstein belongs to Temple Beth El in Bloomfield Hills, Michigan, which is a Reform Jewish synagogue. NBC News reached out for comment to Rabbi Mark Miller, the temple's senior rabbi, but he did not respond. “I don’t begrudge anyone their own personal set of beliefs, but the idea that you would choose a rabbi who is not considered a Jew to deliver this kind of prayer reinforces concerns in the Jewish community that specifically Jewish concerns are not being put front and center,” he said. Shyovitz said he doesn’t doubt that Pence and other evangelical Christians are sincere in their support for Israel and Jews. It’s the "why" that troubles a lot of Jews, he said. Secondly, he said, some trends in contemporary evangelical Christianity seem to be the opposite of anti-Semitic.